I have complete respect for anyone who has the mental fortitude and positive attitude to be grateful that they have cystic fibrosis. I hate cystic fibrosis. I hate having cystic fibrosis. Today, I spent six f’ing hours in the ER. For weeks now, I’ve been having 6 to 8-hour episodes of not feeling well. I feel jittery, nervous, my heart doesn’t beat right, sometimes there’s SOB, chest pains and aches, and I have trouble swallowing. If I had a gun in the house, I wouldn’t be writing this. Trying to work at my job, which is high stress and requires a great deal of concentration and creativity, is the mental equivalent of working in a Chinese coal mine. I know anxiety kicks in and is part of it. However, it starts with something else, not the anxiety. I had high hopes for the visit. The ER is all-new and spectacular. Thanks to my SOB and chest pain, I was escorted to triage right away by the maitre d’hospital. They even surprised me with an immediate EKG, as the nurse took my vitals and looked over my drug list. Then they whisked me to my room and hooked me up to a monitor. Super service. All was great, like a Broadway musical, but without the singing and music. The musical ended quickly when I drew the short straw of ER docs and received a crappy one – the one assigned to Friday at lunch because no one comes in at that time. A coldfish of doctor with zero enthusiasm, who probably should have been a coroner instead. Usually, the ER docs are friendly and curious about CF and ask lots of questions, run tests. Not this guy. After a very brief talk, he disappeared for five hours or so. Tick tock. Did I say how much I hate CF? I told him I had a stress test less than a year ago, which he wrote down. Hmmm, perhaps, he could have asked that question, had he thought it was a good idea to ask any questions. That’s when I made a tough executive decision. I declined to stay. That’s the part where your balls get really big because you’re either stupid or brave – stupid in my case. But that was my medical decision. How could he base any decision on the limited information I gave him? When he left the room, I called my doctor to confirm it was the right decision – he agreed the risk of leaving was low. The nurse came in and hinted that the doctor was conservative and he had been really busy that day. Argh, if I bang my head against your new walls, will you make me clean the blood from them? When I got to the car, I had a panic attack from leaving and had to text and talk to my doctor again to make sure I wasn’t going to die on the spot. This could be my last post, BTW. My doctor thinks my thyroid might be out of whack based on what I told him. Why didn’t the ER doc think of that? Because he didn’t ask questions and wasn’t curious. My first nurse requested that I be her patient when I arrived. She overheard that the guy in the mask, which still confuses them, had CF. She has a brother with CF. He lives in southern Los Angeles, is in his 30s and goes to the same clinic I do. It came up that I have a child. She said he wants to have a child but has the usual male concerns about if he can have a child. I explained how science helped me with a procedure she said her brother didn’t know about. During her lunch break, she called her brother and told him. She said he screamed with joy that he and his fiancée might yet have a child. There was hope. It feels like the reason I went to that ER was for that purpose, to share that information with a wonderful nurse and her brother, who may have been at clinic on the same day I was there. However, he needs to do a little more research and not wait for a crazy man to show up at the ER to tell his sister what’s going on. So says Fox. Oh, well. At least, something positive came from the visit – lemonade from lemons. I hope you feel better now mate. Good to hear the story about the other CF guy and how you will probably help someone else make something positive from their life with CF. How nice of you to visit. I appreciate it. It was such a disappointing experience. New ER, but one doc ruined it for me. You should write about your ER experience on your blog. I’d like to read about it. Hope all is well with you. BTW, wife and I are catching up on the episodes of Glee we missed. Fun show. 🙂 I like reading your blog. I sent you a direct message on twitter about my blog with my bad ER experience. I hope you and your wife enjoy the Glee episodes!!! I love Glee. thanks for the kind words. That season ending episode rocked. It’s interesting to watch the show from the beginning now. They were so different and unpolished. Can’t wait for next season. Am I really talking about Glee? I’ve lost my mind. That’s what happens when 24 goes off the air. The ER can be such a drag, but check out a show called “Party Down” You can stream it on netflix. It has been over a year since I have had to go to the ER, I had a habit of going 4ish times per year for a few years. 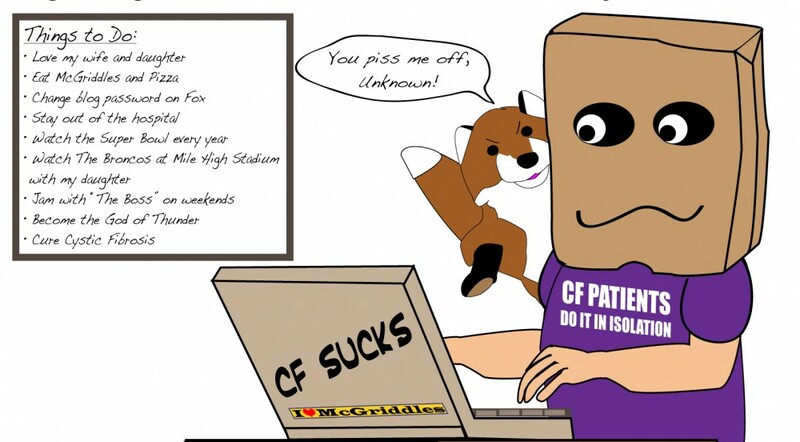 Thank You for bringing out the humor and the dark stuff in the CF world. I keep threatening on starting my own blog. I think I write better when I have a few drinks in me, but I don’t drink much anymore. It feels forced sometimes. Thanks again for a great blog, check out the show, it is funny. I’ll check out the show. I’ve been thinking about rejoining Netflix. Thanks for the tip, comment and visit. I hope you’re ok. Sorry you had such a crummy ER experience. Glad you had the cojones to stand up to the uninterested doc. I would probably have an anxiety attack afterwards if I did the same things. Hoping you figure out what’s making you feel jittery. Thanks, Nanos. I’m feeling better. I’m having mini anxiety attacks here and there since, wondering if I made the correct decision. The information the doc gave me was so incomplete that I worry if something major could be wrong. Argh. I think it’s thyroid. I exceeded the amount of broccoli sane people eat. Sounds like HYPERthyroid symptoms, not HYPOthyroid. That’s what I thought at first, but I have more symptoms under hypo. Weight gain, severe constipation. I may feel jittery, but my pulse is low. It’s hard to tell. I have to see the bloodwork.